Life In Smirleyworld: Great Finds! I haven't been out buying too much lately for my etsy shop because it's been too darn cold and I have SO MUCH STUFF in backstock already but I did find a handful of treasures a week ago at Tickled Pink (vintage bride bingo, a puppies book, and eureka patriotic seals). And then I made up for lost time yesterday! 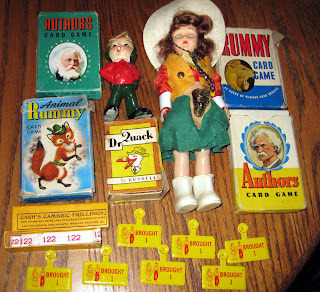 Mom and I went over to the Stewart's Flea Market for a bit and hit the jackpot at my favorite dealer's booth! Lots of goodies for etsy! 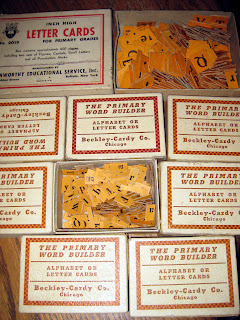 A huge box full of very old turn of the century children's readers, vintage children's books, flash cards, wonderful small alphabet letters for learning, children's playing cards, old magazines from 1910 and the 1950s, pieces of random ephemera, bingo numbers, buttons, a cowgirl doll, etc! Never again will I NOT take my push cart because I'm pretty sure I won't find books! HA! Fortunately, I still had the suitcase roller in my car from scrappin' at Archivers Tuesday! From there, we headed over to The Cheddar Box for a yummy lunch and then on to Shelbyville, KY so mom could pick out fabric for her kitchen windows. We had just enough time to hit one antique mall well and another in the last 5 minutes before closing! Jackpot! Mom found a treasure trove of beautiful, vintage hats for her ever-growing collection and I found some adorable children's books, sunday school tokens and vintage valentines. 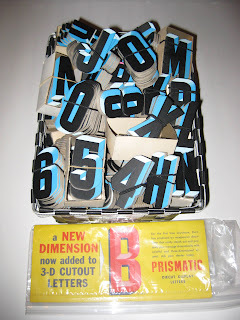 The best find of the day, however, were the three baskets of never used letters from an old hardware store! Dated 1962 on the backs! I was immediately in love! There were red ones and then two different sizes of the black and blue ones! These are going to be awfully hard to part with! Mom and I plan to definitely partake but for now I really just want to leave them in their little baskets and stare at them on display!